I love how I can get a peek inside self-help books without actually having to purchase them, and I love the hosts! They make the podcast fantastic. I enjoy how they break each book into steps and apply to their own lives. Both husbands are supportive which is amazing to hear. Sometimes they get too focused on social justice issues which may not be the topic for the books they review. I love By the Book! The premise is brilliant. Kristen and Jolenta balance being funny, encouraging, and real. I love this podcast! I have always enjoyed selfhelp books, but often the authors' ideas seem worded to make me feel worse about myself. Kristen & Jolenta do a great job of pointing out what you should ignore as well as what actually works. Kristen and Jolenta are joined in the studio by America's favorite husbands: Dean and Brad. The husbands spill the tea on what books they loved and hated from Season 4, why they both love strong women and how their co-workers feel about hearing them on a podcast. To start listening to the Stitcher Premium season By the Book: Authors Tell All, head to stitcherpremium.com and use promo code BOOK for a free month trial. Miracle Suit, beautiful suits that support and flatter all body types. Go to MiracleSuit.com/BOOK to get 20% off any suit. Third Love, the most comfortable bra you'll own.Go to thirdlove.com/BYTHEBOOK for 15% off your first purchase. Better Help, online counseling that is accessible, affordable and convenient. Go to betterhelp.com/btb to get 10% off your first month. Quip, the electric toothbrush that makes brushing your teeth simple and affordable. Go to getquip.com/bythebook to get your first refill pack for free with a Quip electric toothbrush. The ladies rehash the season! Do Kristen and Jolenta have any new revelations since living by the books of Season 4? What stuck and what was pure torture? MiracleSuit.com, beautiful suits that support and flatter all body types. Go to MiracleSuit.com/BOOK to get 20% off any suit. Hum Nutrition, vitamins and supplements for clearer skin, boosted energy, or fuller hair. Go to humnutrition.com/get_started. Get 20% off your purchase with code BTB. Phlur, the world-class perfume that is non-toxic and gender-free. Go to PHLUR.com and use promo code BOOK to get 20% off your first three Phlur fragrance samples. Modern Fertility, an at-home hormone fertility test. Visit ModernFertility.com/BTB. Take the fertility quiz and get twenty dollars off your Modern Fertility test. The ladies discuss the aftermath of living by Don Miguel Ruiz's New York Times bestseller The Four Agreements. Plus, they have a surprise announcement! Kristen and Jolenta pop in with a preview of Just Between Us, a new podcast from the Stitcher family. Join co-dependent besties and hosts Allison Raskin and Gaby Dunn for their new comedic variety show! Check out this trailer and then find full episodes of Just Between Us by searching "Just Between Us" in your favorite podcast player. The ladies live by Don Miguel Ruiz's New York Times bestseller The Four Agreements. Brass Clothing, women-owned online retailer dedicated to giving women clothing they need - so they can spend their energy on the things that really matter. Visit brassclothing.com and use promo code BYTHEBOOK for 15% off your first order. Burrow, the the super comfortable, high quality, and easy-to-set-up sofa. Save $75 on a new sofa by visiting burrow.com/bythebook. Quay, quality fashion sunglasses at an affordable price point. To enjoy 20% off your order go to quayaustraliacom and enter promo code BTB. The ladies read listener comments and feedback about living by Astrology for Happiness and Success by Mecca Woods. 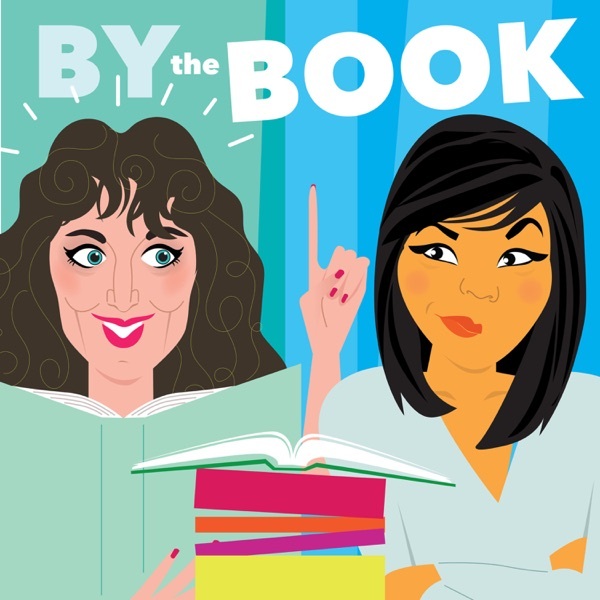 Plus, Kristen and Jolenta reveal the sign that a majority of By the Book listeners are! Wander Beauty, a new line of easy-to-use, multitasking beauty products. Go to wanderbeauty.com/bythebook to get 20% off your purchase. The ladies live by Astrology for Happiness and Success by Mecca Woods. Will Kristen learn to love astrology? Will Jolenta create the life she wants by using the stars as her guide? Brass Clothing, women-owned online retailer dedicated to giving women the clothing they need - so they can spend their energy on the things that really matter. Visit brassclothing.com and use promo code BYTHEBOOK for 15% off your first order. The ladies read listener comments and questions about living by Elizabeth Gilbert's Big Magic: Creative Living Beyond Fear. Plus, they share how members of the By the Book Facebook community have been expressing their creativity! The ladies try to tap into their creativity with Elizabeth Gilbert's Big Magic: Creative Living Beyond Fear. Jolenta and Kristen reply to listener comments, criticisms and questions about their experience living by Päntsdrunk: Kalsarikänni: The Finnish Path to Relaxation. Plus, they announce next week's book! Kristen and Jolenta try päntsdrunk - the Finnish term for drinking at home, alone, in your underwear! Join the ladies as they live by Miska Rantanen's Päntsdrunk: Kalsarikänni: The Finnish Path to Relaxation. Will päntsdrunk help them find inner peace and happiness? Listen to the new Stitcher podcast Josie and Jonny Are Having a Baby With You. The show follows Josie and Jonny through their not-totally-planned pregnancy as they try to prepare for the birth of their first child. Jolenta and Kristen read listener comments about their experience living by Pick Three and announce next week's book! In order to support our show, we need the help of some great advertisers. And, in order to find great advertisers, we need to learn a little bit more about you. So please, go to podsurvey.com/btb and take a quick, anonymous survey that will help us get to know you a little better. The ladies live by Randi Zuckerberg's New York Times bestseller, Pick Three: You Can Have It All (Just Not Everyday). 60. Bonus Episode: The Husbands Speak Again...Again! 41. Bonus Episode: Ask Us More Of Anything! 40. Bonus Episode: The Husbands Speak...Again! When Meghan Met Harry: What's The Deal With Royals and Divorce?